The Pictionary / Words With Friends hybrid Draw Something has exploded over the past few months with sources predicting it will now have amassed more than 50 million (yes, million) downloads in a matter of weeks. But are we all still as excited to use our chubby little fingers to scribble rubbish pictures of Bieber, dandruff and a boat? Whether you’re a huge fan or already a bit sick of the hype, you can’t deny that Draw Something has achieved great things recently. A few weeks ago the company behind the app, OMGPOP, was allegedly bought by Zynga for a cool $180 million and now, according to Business Insider, Draw Something will have most likely surpassed 50 million downloads today, making it the fastest growing app EVER. Over the past few weeks we’ve witnessed (first hand) the excitement, and to a certain extent madness, Draw Something can bring into our lives. Endless hours are spent analysing how we portray the most basic of objects, we all feel compelled to buy more colours so Shrek is more accurate and we admit we’ve even considered splashing out on an iPad JUST so our drawings look a little more detailed. Think of it as some kind of fast-moving, life consuming virus that slowly chips away at your sanity one coin at a time. But even though everyone we know is hooked, are some of us slowly realising we’re immune to the Draw Something virus? Let’s clear something up. 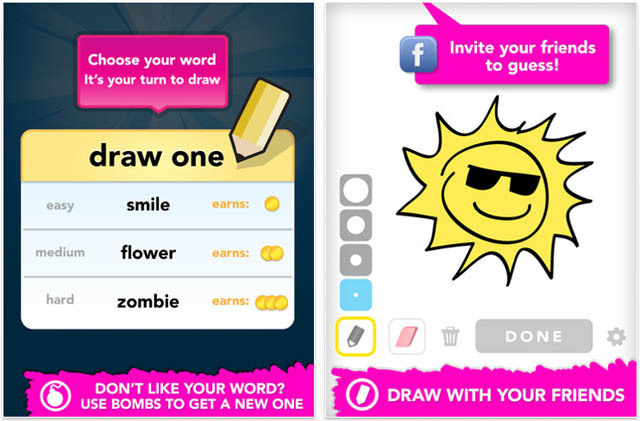 We’re not denying Draw Something is an awesome, addictive and extremely popular mobile game. However, we do think an app that grew SO quickly does have the potential to fall out of favour just as fast. Yes, we know in many ways they’re not comparable, but it makes us think a little of Chat Roulette, a strange concept that had everyone hooked for about 14 days before the exhibitionists and crazies took over. Now we’re not telling you to expect 5,678,884 drawings of penises from random people on Draw Something, but we do suspect it may die out as quickly as it appeared on our radars, just like Chat Roulette did. Are we already bored of the Draw Something app? Over the past few weeks we've witnessed (first hand) the excitement, and to a certain extent madness, Draw Something can bring into our lives.